The past week has been an unsettling one. For one, my asthma has been giving me grief, coming and going at whim and keeping me on edge guessing when the next attack will hit. The side effect to this is that I have not been able to rest well, falling either into a drug- and exhaustion-induced stupour or labouring all night with inhaler in hand, afraid to sleep in case I forget to wheeze ... I mean, breathe. Throughout it all I have been experiencing a deep unrest. A creeping uneasiness that all is not well in the world. I could not pinpoint the origins or even the components of this prickling of the soul. I just felt that something was wrong. I was watching the late news two nights ago. A fairly uncommon thing for me to do but I was channel surfing and happened to stop just at a news coverage of an overturned bus full of children. For some reason, I stopped right there. The next coverage came on. A long-serving, senior policeman had been found in his home with a bullet through his head. His name was Hansen. He was from the commercial crime unit. He was 35 years old. My mouth fell agape. Late last year, I was involved in a criminal investigation. The senior officer in charge was called Hansen. From the commercial crime unit. He was in his mid-30s. I made fun of him. Called him the Bogus Policeman because he seemed to think I might be a master criminal. Now he's dead. Despite the sparse information, it appears that it may be suicide. The first instinct was disbelief. It could not be the same man. There must be more than one senior policeman with the name of Hansen. In the commercial crime unit. Around his mid-30s. But somehow, I knew it was the same man. Did I sense he might have done himself in? Honestly, I'd thought he was a little strange and awkward, as if he was trying to slough off a cheery demeanour when the underlying brick was crumbling. But suicidal? No. Odd, yes. I feel really bad for speaking badly of the dead, but he did not strike me as a very good policeman. He seemed nice enough but the job seemed to be both overwhelming and underwhelming him at the same time. Above it all, he was slightly odd. Somehow, he made me uncomfortable. There were some inappropriate questions and comments. "What do you do with your free time?" "I seldom have free time. I am always working. And when I am not, I am just trying to run errands or complete tasks at home which have languished while I have been slaving at work. Why?" "You poor thing. Why should you work so hard. It's not good for you." "I know but it's kind of difficult when the partners and clients put everything on you. But I am trying." "So if you had time, what do you do?" "Lots of things. Paint. Cook. Sew. Dance. Read. Yoga ..."
"All those things you do on your own. Isn't that boring? Being on your own?" "No. I really like being on my own. I'm my favourite person to hang out and do nothing with. I seldom have a chance to do that." "Being alone is not a good thing." I got the sense he was lonely and not really liking it. At first, I thought he might have been making some inappropriate come-ons with his personal questions that came out of the blue. Or perhaps, it was his technique to disarm me and hopefully, garner some kind of confession. Whatever it was, he came across as slightly lost. Slightly lonely. Slightly trying to disguise his disaffectedness with nerdy machismo. The next day, I pounced on the newspapers to find out if it was the same policeman. It was. He was from the same police station where I was questioned. I felt an overwhelming sense of guilt. I'm Catholic. I'm very equipped for this. Did I say or do something to add to his depression? I should not have made fun of him. Should I have gone with my senses to probe behind his poorly-disguised whisper for help? Should I have been less wary and dismissive and opened up to listen carefully when he revealed his fear of loneliness? How could he have been lonely with a wife and two children? What a stupid question ... you can be alone in a crowd of millions crushing you on all sides daily. Should I have been kinder? Could I have helped in any way? Am I being arrogant for even thinking that I played any role in this? Questions. Questions. Questions. I feel for his wife. I saw the footage of her wild grief and her family's bewildered sorrow. It's so strange. The past two weeks have been tinged with loss and death. A friend remembered. An acquaintance lost. The temptation to send a condolence card is strong. But a natural reticence remains. The grieving widow may get the wrong impression receiving a card from an unkown female. Especially when I barely knew the man despite almost 6 hours being interrogated by him. And his buying my lawyer and I dinner after realising he was on the wrong track. Whatever it is, I will say a little prayer for Officer Hansen. Light a candle for him. I hope he has found his peace somewhere and never feel lonely again. I know how you feel, having been in the same situation before. My suggestion: Don't dwell on what could have been. Just go with the present and the future. 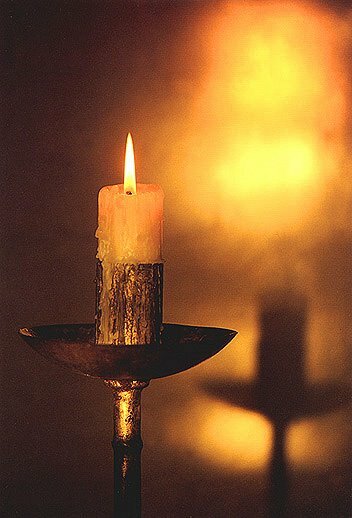 If you think lighting a candle or some other gesture will help either or both of you, then do so. You take care, yah. *boggle* Same guy? Damn. That's surreal. However, there's no need to blame yourself. I seriously doubt anything you did back then would have added anything substantial to his misery. Whatever his reasons for offing himself, they were powerful enough that he felt he had to abandon his family: my guess is he thought they'd be better off without him and kept his pain hidden from them. That, my dear, was a very selfish reaction on his part, and certainly none of your fault. Hugs to you MM, i second what 3agurl and nishiko said.